Figure 6.3. Probability distributions (fix)} of climate damages (market and nonmarket components combined) f rom an e vpert survey in which respondents were asked to estimate 10th, 50th, and ^Oth percentiles for the two climate change scenarios shown. From Roughgarden and Schneider, 1999. Data from Nordhaus, 1994.
and Keitb, but this time foeused on the impacts of several scenarios of climatic change on world economic product, including standard market sector categories (e.g., forestry, agriculture, heating and cooling demands) as well as so-called nonmarket sectors such as biological conservation, international equity, and national security. When Nordhaus surveyed the opinions of mainstream economists, environmental economists, and natural scientists (I am respondent 10 in Nordhaus, 1994), he found that the former expressed a factor of 20 less anxiety about the economic or environmental consequences of climate change than the latter (see Figure 6,3). However, the bulk of even the conservative group of economists Nordhaus surveyed considered there to be at least a 10% probability that typically projected climate changes could still cause economic damages worth several percent of gross world product (the current U.S. GNP is around five trillion dollars, about 20% of the global figure). And some of these economists didn't include estimates for possible costs of nonmarket damages (e.g., harm to nature). 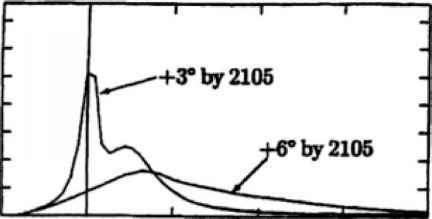 One ccologist who did explicitly factor in nonmarket values for natural systems went so far as to assign (for 6 C warming) a 10% chance of a 100% loss of GNP - the virtual end of civilization! Although Nordhaus observed that those who know the most about the economy are "comparatively unconcerned," I countered with the obvious observation that those who know the most about nature are comparatively very concerned (e.g., see Roughgarden and Schneider, 1999). We will not easily resolve the paradigm gulf between the relatively optimistic and pessimistic views of these specialists, w ho have different training, traditions, and world-views. But the one thing that is clear from both the Morgan and Keith and the Nordhaus studies is that the vast majority of knowledgeable experts from a variety of fields admits to a wide range of plausible outcomes in the area of climate change - including both mild and catastrophic eventualities - under the broad umbrella of possibilities. This is a condition ripe for misinterpretation by those who are unfamiliar with the wide range of probabilities most scientists attach to climate change issues. The wide range of probabilities follows from recognition of the many uncertainties in data and assumptions still inherent in climate models, climatic impact models, and economic models, or their synthesis via integrated assessment models (see Schneider, 1997a,b). In a highly interdisciplinary enterprise such as the integrated assessment of climate change problems. it is necessary to include a wide range of possible outcomes, along with a representative sample of the subjective probabilities that knowledgeable assessment groups such as the IPCC believe accompany each of those possible outcomes. In essence, the "bottom line" of estimating climatic impacts is that both "the end of the world" and "it is good for business" are the two lowest-probability outcomes, and the vast majority of knowledgeable scientists and economists considers there to be a significant chance of climatic damage to both natural and social systems. Under these conditions - and the unlikelihood that research will soon eliminate the large uncertainties that still persist it is not surprising that most formal climatic impact assessments have called for cautious but positive steps, both to slow the rate at which humans modify the climatic system and to make natural and social systems more resilient to whatever changes eventually materialize (e.g.. National Academy of Sciences, 1991). 6.4.1 What Are Some Actions to Consider? 1. Continue the aggressive phaseout ofCFC and other halocarbon emissions and the development of substitutes that minimize or eliminate greenhouse gas emissions. 2. Study in detail the "full social cost pricing" of energy, with a goal of gradually introducing such a system. On the basis of the principle that the polluter should pay, pricing of energy production and use should reflect the full costs of the associated environmental problems. 3. Reduce the emissions of greenhouse gases during energy use and consumption by enhancing conservation and efficiency. 4. Make greenhouse warming a key factor in planning for our future energy supply mix. The United States should adopt a systems approach that considers the interactions among supply, conversion, end use, and external effects in improving the economics and performance of the overall energy system. 6. Explore a moderate domestic reforestation program and support international reforestation efforts. 7. Maintain basic, applied, and experimental agricultural research to help farmers and commerce adapt to climate change and thus ensure ample food. 8. Make water supply more robust by coping with present variability by increasing efficiency of use through w ater markets and by better management of present sy stems of supply. 9. Plan margins of safety for long-lived structures to take into consideration possible climate change. 10. Move to slow present losses in biodiversity. 11. Undertake research and development projects to improve our understanding of both the potential of geoengineering options to offset global warming and their possible side effects. This is not a recommendation that geoengineering options be undertaken at this time, but rather that we learn more about their likely advantages and disadvantages. 12. Control of population grow th has the potential to make a major contribution to raising living standards and to easing environmental problems like greenhouse warming. The United States should resume full participation in international programs to slowr population growth and should contribute its share to their financial and other support. 13. The United States should participate fully with officials at an appropriate level in international agreements and in programs to address greenhouse warming, including diplomatic conventions and research and development efforts. This National Academy of Sciences (1991) assessment produced a remarkable list, considering the diversity of the participants1 backgrounds and their varying ideological perspectives. It even recommends "international agreements ... including diplomatic conventions," something that indeed occurred at Kyoto in 1997. In the crucible of open debate that permeated this scientific and policy assessment activity, the self-interest polemics and media grandstanding typical of the Kyoto event (e.g., see Schneider, 1998a for an account) did not occur. This NAS group didn't assert that catastrophe was inevitable, nor that it was improbable. The National Research Council assessors simply believed that "despite the great uncertainties, greenhouse warming is a potential threat sufficient to justify action now." Integrated assessments of the policy options offered by the National Research Council report are actively being pursued with a variety of models. This comprehensive list of recommendations from the National Research Council report still overlooks two fundamental policy options: the desperate need for (1) an intelligent, nonpolemical public debate about climate change and (2) interdisciplinary public education that also teaches about whole systems and long-term risk management and not only traditional areas of isolated, disciplinary specialization. 6.4.2 Environment and (or Versus) Development? death rates, increase life expectancy, provide employment for burgeoning populations, and reduce local air and water pollution that poses imminent health hazards to their citizens and environments. Protecting species or slowing climate change are simply low on their priority lists as compared with those of more mature economic powers such as the Organization for Economic Cooperation and Development (OECD) nations. It is unfortunate that LDCs place a low priority on the abatement of global climate change because nearly all impact assessments suggest that it is these very countries that are most v ulnerable to climatic change (e.g., Rosenzweig and Parry, 1994). There is a phrase in economics known as "the marginal dollar." In our context it means that given all the complexity of interconnected physical, biological, and social systems, climate abatement may not be perceived as the best place to invest the next av ailable dollar so as to bring the maximum social benefit to poor countries. I have heard many representatives of LDCs exclaim that until poverty is corrected, preventable disease stamped out, injustice redressed, and economic equity achieved, they will invest their precious resources on these priorities. My response has been that climatic changes can exacerbate all those problems they rightly wish to address, and thus we should seek to make investments that both reduce the risks of climate change and help with economic development (transfer of efficient technologies being a prime example). It is a great mistake, I believe, to get trapped in the false logic of the mythical "marginal dollar," for it is not necessary that every penny of the next available dollar go exclusively to the highest-priority problem w hereas all the rest (particularly problems w ith surprise potential and the possibility of irreversible damages) must wait until priority 1 is fully achieved. To me, the first step is to get that "marginal dollar"1 cashed into "small change" so that many interlinked priority problems can be al least partially addressed. Given the large state of uncertainty surrounding both the costs and the benefits of many human and natural events, it seems most prudent to address many issues simultaneously and to constantly reassess which investments are working and which problems - including climate change - are growing more or less serious. define as "dangerous") are to, be avoided, Most economists» on the other hand, often argue that new technologies will be able to accomplish carbon abatement more cheaply in the future as such technologies are developed and deployed (Wigley et al., 19%). i hus, their logic suggests that a cost-effective time profile of abatement w ould be to postpone most carbon reductions until later in the 21st century. This seemingly implacable debate will echo well past the Kyoto meeting. My colleague, Stanford University economist Lawrence Goulder, and I have used state-of-the-art economic modeling tools to study this debate, and we conclude that both the stereotypical environmentalist position (to abate now) and economist position (abate later) are actually not incompatible; rather, they are complementary. We show (Schneider and Goulder, 1997) that although the economist view that future abatement is likely to be cheaper is probably correct, so too is the environmentalist argument that current actions arc urgently needed, because such technologies referred to in economic cost-effectiveness studies won't simply invent themselves. In other words, policy actions to help induce technological changes are needed now in order to bring about a profile of cost-effective abatement in the decades ahead (see also HofTert et al., \ 998). Schneider and Goulder also address the relative economic efficiency of alternative policy instruments: contrasting carbon taxes versus research and development (R&D) subsidies. Although we recognize the political reluctance of many people to embrace any new taxes, in truth, most economic analyses show that a fee for the use of the atmosphere (currently a "free sewer11) will reduce incentives to pollute, will increase incentives to develop and deploy less-polluting technologies, and can be more economically efficient than other policies, particularly if some of the revenues generated by a carbon tax were recycled hack into the economy (e.g., Hamond et al., 1997). R&D subsidies can be economically efficient, our conventional economic analyses suggest, to the extent that current R&H markets are already subsidized or otherwise not optimally efficient - a very real likelihood (e.g., Goulder and Schneider, 1999). A condensed summary of my principal conclusions is as follows, beginning w ith the more narrowly technical issues and proceeding to broader generalizations about human impacts, uncertainties, and policy choices. Earth System - are needed for climatic effects assessment. The simpler models are more transparent - allowing cause-and-effect processes to be more easily traced - and are much more tractable to construct, run and diagnose, whereas multidimensional, dynamic models can provide geographic and temporal resolution needed for regional impact assessments and, hopefully, provide more-realistic and detailed simulations, even if at much higher costs for construction, computation, diagnosis, and interpretability. Ikcause the real climate system is undergoing a transient response to regionally heterogeneous (patchy) forcings (e.g., aerosols and greenhouse gases combined, which both vary over time and space), eventually it will be necessary to run fully coupled three-dimensional Earth Systems models in order to "hand oft"' their results to a variety of regional impact assessment models. In the interim, lower-resolution, "simple" climate models can be hybridized into more-comprehensive models to produce hybrid estimates of time-evolving regional patterns of climatic changes from a variet y of emissions and land use change scenarios. Such estimates may be instructive to policy makers interested in the differential climatic impacts of various climate forcing scenarios and/or various assumptions about the internal dynamics of both climate and impact models. It is unlikely that all important uncertainties in either climatic or social and environmental impact models will be resolved to the satisfaction of the bulk of the scientific community in the near future. However, this does not imply that model results arc uninformative. On the contrary, sensitivity analyses in which various policy-driven alternative radiative forcing assumptions are made can offer insights into the potential effectiveness of such policies in terms of their differential climatic effects and impacts. Even though absolute accuracy is not likely to be claimed for the foreseeable future, considerable precision concerning the sensit ivity of the physical and biological subsystems of the Earth can be studied via carefully planned and executed sensitivity studies across a hierarchy of models. Although it may be impractical, if not theoretically impossible, to validate the precise future course of climate given the uncertainties that remain in forcings, internal dynamics, and unpredictable surprise events, many of the basic features of the coupled physical and biological subsystems of the Earth can already be simulated to a considerable degree. Testing models against each other when driv en by the same sets of forcing scenarios, testing the overall simulation skill of models against empirical observations, testing model parameterizations against high-resolution process models or data sets, testing models against proxy data of paleoclimatic changes, and testing the sensitivity of models to radiative forcings of anthropogenic origin by computing their sensitivity to natural radiative forcings (e.g., seasonal radiative forcing, volcanic dust forcing, orbital element variation forcings, melt water-induced rapid ocean current changes, etc.) constitute a necessary set of validation-oriented exercises that all modelers should agree to perform. Similarly, impacts models should also be subjected to an analogous set of validation protocols if their insights are to gain a high degree of credibility. In addition to standard simulation modeling exercises in which various parameters are specified or varied over an uncertainty range, formal decision-analytic techniques can be used to provide a more consistent set of values for uncertain model parameters or functional relationships (e.g., Moss and Schneider, 1997). The embedding of subjective probability distributions into climatic models is only beginning (e.g., Titus and Narayanan, 1996), but it may become an important element of IA modeling in future generations of model building (e.g., see the discussion of the hierarchy of IAMs in Schneider, 1997b). It is obvious that the projection of climatic effects and related impacts will continue to change as the state of the art in both kinds of models improves over the next few decades. Therefore, the most flexible management possible of a global commons like the Earth's climate seems a v irtual necessity; the potential seriousness of the problem - or even the perception of that seriousness - is virtually certain to change with new discoveries and actual climatic and other environmental or societal events. Therefore, a series of assessments of climatic effects, related impacts, and policy options to prevent potentially dangerous impacts will be needed periodically - perhaps every five years, as IPCC has chosen for the repeat period of its major Assessment Reports, w hich treat climatic effects, impacts, and policy issues as separable assessments. It seems important that whatever policy instruments are employed (either to mitigate anthropogenic forcings or to help reduce damage from projected climatic effects) be flexible enough to respond quickly and cost-effect i vely to the evolving science that will emerge from this rolling reassessment process. Given the many uncertainties that still attend most aspects of the climatic change and impacts debate, priority should be considered for those aspects that could exhibit irreversible damages (e.g., extinction of species w hose already-shrinking habitat is further stressed by rapid climatic changes) or for w hich imaginable "surprises11 (e.g., Schneider et al., 1998) have been identified (e.g., alterations to oceanic currents from rapid increases in greenhouse gases; sec Broecker, 1997, or Rahmstorf, 1997). For these reasons, management of climatic risks must to be considered well in advance of more certain know ledge of climatic effects and impacts. Intergovernmental Panel on Qimatic Change (IPCC) (1997). Workshop on Regional Climate Change Projection!» for Impact Assessment, Impe rial College, London, 24—26 September 1996. Intergovernmental Panel on Climatic Change (IPCC) (1998). The Regional Impacts of Climate Change. An Assessment of Vulnerability. A Special Report of IPCC Working Group II, eds. R. T. Watson, M. C. Zinyowera, and R. IE. Moss. Cambridge: Cambridge University Press. Kelly, D. 1and Kolstad, C1)., in press. Integrated assessment models for elimate change control. International Yearbook of Environmental and Resource Economics I999/20M): A Survey of Current Issues. Cheltenham, UK: Edw ard Elgar. Manri, M. E., liradley, R. S., and Hughes, M. K. (1999). Northern hemisphere temperatures during the past millennium: Inferences, uncertainties, and limitations. Geophysical Research Utter, 26, 759. Mass, C., and Schneider S. H. (1977). Influence of sunspots and volcanic dust on long-term temperature records inferred by statistical investigations*. Journal of Atmospheric Science, 34, 1995-2004. IXC. : National Academy Press. Nordhaus, W. D. (1992)* An optimal transition path for controlling greenhouse gases. Science, 25 K, 1315-1319. Nordhaus, W. D (1994). Expert opinion on climate change, American Scientist, 82,45—51, Overpeck, J. T., Webb, R. S., and Webb 111, T (1992). Mapping eastern North American vegetation change over the past IH^HH) years: No analogs and the future. 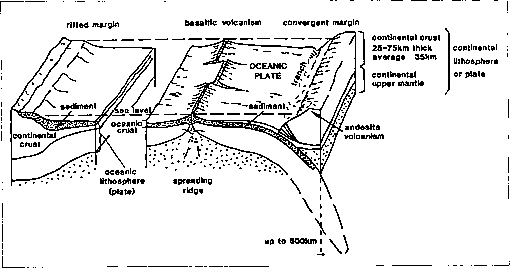 Geology, 20, 10711074. Rahmsiorf, S., and GanopoUki, A. (1999). Long-term global warming scenarios computed with an efficient coupled climate model. Climatic Change, 43, 353-67, Ranianathan, V. (I9HI). The role of ocean-atmospheric interactions in the COj climate problem. Journal of Atmospheric Science, 38,918-930, Raval, A., and Ranianathan, V. (1989), Observational determination of the greenhouse effect. Nature, 342,758. Rosenzweig, C, and Parrv, M. (1994). Potential impact of climate change on world food supply. Nature, 367,133-138. Rotmans, J., and van Assdt, M. (1996). Integrated assessment: a growing child on its way to maturity - an editorial. Climatic Change, 34, 327-336. Roughgarden, T., and Schneider, S. H, (1999). Climate change policy: Quantifying uncertainties for damages and optimal carbon taxes. Energy Policy 27(7), 415-429, Santer, B I) , Taylor, K. E., Wigley, T. M. L,, Johns, T C. , Jones, P. D., Karoly, D. J. Mitchell, J. F. B., Oort, A, IL, Penner, J. E., Ramaswamy, V,, Schwarzkopf, M. 1>, StoulTer, R. J., and Tett, S. (1996). A search for human influences on the thermal structure of the atmosphere. Nature, 382, 39-46. Schneider, S. H. (1993). Can paleoclimatic and palcoecological analyses validate future global climate and ecological change projections? In: Global Changes in the Perspective of the Past, eds, J. A. Eddy and H, Oeschgcr New York: John W iley and Sons. Schneider, S. H. (1994). Detecting climatic change signals: Are there any "fingerprints"? Science, 263, 341-347. Schneider, S. H. (1997a). Laboratory Earth: The Planetary Gamble We Can't Afford to Lose. Schneider, S. H. (1998a). Kyoto Protocol: The Unfinished agenda. An editorial essay. Climatic Change, 39, 1-21. Schneider, S. IL (1998b). The climate for greenhouse policy in the U.S. and the incorporation of uncertainties into integrated assessments. Energy and Environment, 9, 425 440. Schneider, S, H,, and Goulder, L. (1997). Achieving carbon dioxide concentration targets. What needs to be done now: Nature, 389, 13-14. Schneider, S. H., and Londer, R. (1984), The Coevolution of Climate and Life. San Francisco: Sierra Club Books. Schneider, S. H., and Mesirow, L. E. (1976). The Genesis Strategy: Climate and Global Survival. New York: Plenum. Schneider, S. H., Turner II, B. L., and Morehouse Garriga, H. (1998). Imaginable surprise in global change science. Journal of Risk Research, 1, 165-185. Sorenson, L. G., Goldberg, RRoot, T L., and Anderson, M. G. (1998). Potential effects of global warming oil waterfowl populations breeding in the northern Great Plains. Climatic Change, 40, 343-369. Stocker, T. K, and Schmittner, A, (1997), Influence ofOOj emission rates on the stability of the thermohaline circulation. Nature, 388, 862-865. Thompson, S. L., and Schneider, S. IL (1982). CO? and climate: The importance of realistic geography in estimating the transient response. Science, 217, 1031-1033. Titus, J., and Narayanan, V. (1996), The risk of sea level rise: A dclphic monte carlo analysis in which twenty researchers specify subjective probability distributions for model coefficients within their respective areas of expertise. Climatic Change, 33„ 151-212. Trenberth, K. E. (ed.). (1992). Climate System Modeling. Cambridge: Cambridge University Press. Washington, W. \1., and Parkinson, C. L. (1986). An Introduction to Three-Dimensional Climate Modeling. New York: Oxford University Press. Wtgley, T. M. L., Richels, R., and Edmonds, J, A. (1996). Economic and environmental choices in the stabilizations of atmospheric CQ2 concentrations. Nature, 379, 240-243. Wright, I I. E., kutzbach, J. E., Webb III, T, Ruddiman,\V. F., Street-Perrott, F. A., and Bartlcin, P. J., eds. (1993). Global Climates Since the Last Glacial Maximum. Minneapolis: University of Minnesota Press. Vang, C., and Schneider, S. H. (1998), Global carbon dioxide emissions scenarios: Sensitivity to social and technological factors in three regions. Mitigation and Adaptation Strategics for Global Change, 2, 373-404.